MORRIS, Robert, (father of Thomas Morris [1771-1849]), a Delegate and a Senator from Pennsylvania; born in Liverpool, England, January 20, 1734; immigrated to the United States in 1747 and settled in Oxford, Md. 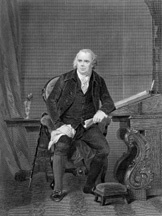 ; attended school in Philadelphia; became a merchant in Philadelphia in 1748; signed the non-importation agreement of 1765; member of the Pennsylvania Council of Safety 1775; Member of the Continental Congress 1775-1778; signer of the Declaration of Independence; settled upon the Manheim estate; member, State assembly 1778-1781; national superintendent of finance 1781-1784; established the Bank of North America; member, State assembly 1785-1787; delegate to the Federal Constitutional Convention in Philadelphia in 1787 and one of the signers of the Constitution; elected to the United States Senate and served from March 4, 1789, to March 3, 1795; declined to be a candidate for renomination; declined the position of Secretary of the Treasury in the Cabinet of President George Washington; known as the financier of the American Revolution and one of the richest men in America, Morris became involved in unsuccessful land speculations, which caused him to be imprisoned for debt from 1798 to 1801; died in Philadelphia, Pa., May 8, 1806; interment in the family vault of William White in the churchyard of Christ Church. Dictionary of American Biography; Morris, Robert. Papers. Edited by E. James Ferguson, John Catanzariti, Elizabeth M. Nuxoll, Mary A.Y. Gallagher, et al. 9 vols. to date. Pittsburgh: University of Pittsburgh, 1973-; Ver Steeg, Clarence. Robert Morris: Revolutionary Financier. New York: Octagon Books, 1972.